Crab sticks in Russia are very popular, as they are used for cooking various salads, appetizers and other dishes. An important role was played by the low cost of the product and its availability, how to buy crab sticks can be almost any store. 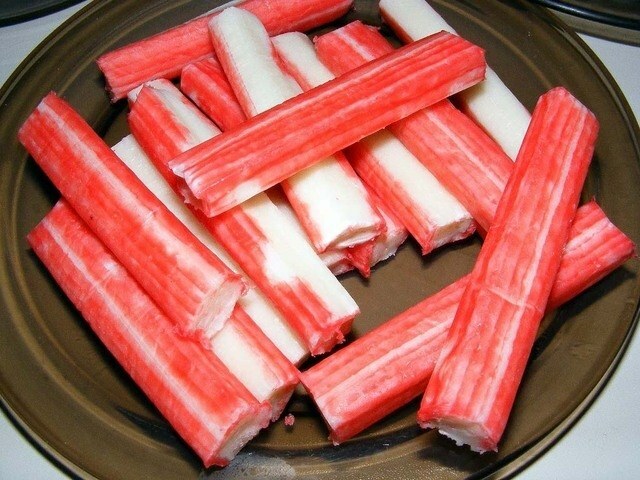 Contrary to popular belief and according to studies many test purchases, low cost crab sticks provided by the lack of even a small portion of crab meat. Usually the structure of this ready to use product composed of minced fish, starch and soy protein. These ingredients are pressed and generously sdobrivayut crab flavor and slightly similar in taste to the meat of this marine life. Unfortunately, some unscrupulous manufacturers do not use minced fish, and only fish by-products that throw a pity. So if you like to add shrimp to salads, the store carefully study their composition. Relatively good quality product should include surimi (commercial name of minced fish), drinking water, starch, egg protein, soy protein, vegetable oil, sugar and salt as well as stabilizers and flavor enhancers. Of course, these crab sticks will not bring you any benefit, but great harm from them will not. The benefit of this product is close to zero, as they quite can be called a natural product. The method of preparation of surimi practically excludes from minced fish are all healthy fats, vitamins and minerals. In the finished product contains only fish protein, well, if surimi is prepared from offal, and the latter are still quite small. Much more can be said about the harms of crab sticks. In order to understand its possible degree, just study the composition of the product. Commonly when cooking crab sticks are used food additive E171, Е160, E450 and E420 that are being banned in the food industry, but can be a cause of exacerbation of chronic diseases of the gastrointestinal tract, allergies and others. Another important factor is minced fish, part crab sticks, not subjected to preliminary heat treatment, so a high hazard microbiological contamination. All, of course, depends on the manufacturer and checking on the food of the competent authorities, but the average consumer should seriously fear the presence of harmful and dangerous microorganisms. Especially not to buy the crab sticks in bulk even at very low prices and should give preference to the products in the package.